Stephen Johnson Turre (born 12 September 1948 Omaha, Nebraska) is an American jazz trombonist and a pioneer of using seashells as instruments, a composer, arranger, and educator at the collegiate-conservatory level. For fifty-five years, Turre has been active in jazz, rock, and Latin jazz – in live venues, recording studios, television, and cinema production. He has recorded over 20 albums as a bandleader, and appeared on many more as a contributor or sideman. As a studio musician, Turre is among the most prolific living jazz trombonists in the world. He has been a member of the Saturday Night Live Band since 1984. Turre is one of five children born to James Boles Turre (1921–1997) and Carmen Marie (née Johnson). His father was of Italian ancestry and his mother was of Mexican ancestry. His three siblings are Michael James Turre (b. 1946), Suzanne Turre (born 1952), Michele Anita Turre (born 1953), and Peter Joseph Turre (born 1957). Michael and Peter are musicians – saxophone-woodwinds and drums, respectively. Turre was raised in Lafayette, California (San Francisco Bay area). He began playing trombone at age ten, during his fourth grade in school. In his early teens, he played in a band with his elder brother, Michael. Although he entered California State University, Sacramento, on a football scholarship, he studied music theory there for two years before transferring to the University of North Texas College of Music, where he studied from 1968 to 1969 and played in a band led by trumpeter Hannibal Peterson. Turre has been a resident of Montclair, New Jersey. Turre has been married twice. His first wife was Susan J. Beard, whom he married in 1970 in Dallas, Texas, and divorced in 1972 in San Francisco. His second wife was cellist Akua Dixon (born 1948) from 1978 to 2012, with whom he had two children, a singer and a drummer. In 1968, Turre played with Rahsaan Roland Kirk. In 1970 he recorded with Carlos Santana, and in 1972 he toured with Ray Charles. He has been trombonist for the Saturday Night Live band since 1985 and has taught jazz trombone at the Manhattan School of Music since 1988. For forty-eight years (since 1970), Turre has been an exponent of seashells – conch in particular – as serious musical instruments. According to Turre, encouragement came from Kirk who was known for using a vast array of saxophones, flutes and other instruments. Turre has a collection of shells of various sizes, most of them picked up during his travels in the Caribbean and elsewhere. The shells have their mouthpieces carefully cut and are tuned to specific pitches. When playing them as a soloist, he frequently switches between shells, as each is limited in its register (the smallest shells, for example, have a practical register of only a fifth). His largest shell, from the Great Barrier Reef of Australia, has a range between the D and E below middle C, and was painted by a Cuban artist. He also leads "Sanctified Shells," which is a "shell choir" made up of brass players who double on seashell (using shells from Turre's collection, which he loans out for rehearsals and performances). The group released its first, eponymous album in 1993. Turre has had a long experience with Latin jazz and is a skilled player of the cowbell and Venezuelan maracas. Turre has been a member of the Juilliard School faculty for twelve years – since 2008, and previously from 2001 to 2003. In March 2018 he was anonymously referred to as a perpetrator in an online editorial entitled "Token Girl," a piece which discussed misogyny within the Juilliard jazz program. 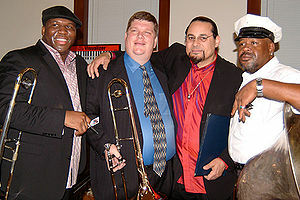 Turre earned his bachelor's degree from the University of Massachusetts Amherst through the University Without Walls in 1980 with a focus in Afro-American Music and Jazz. ^ Wirt, George. "Steve Turre: a lifelong love affair with the trombone", The Montclair Times, January 13, 2011, backed up by the Internet Archive as of January 16, 2011. Accessed September 18, 2017. "An active supporter of jazz education, Montclair trombonist Steve Turre (second from left), is shown above, with Montclair musicians, from left, vocalist Melissa Walker, drummer Billy Hart, and saxophonists Bruce Williams and Mike Lee as they take a break during their performance at the Jazz House Kids Bebop-a-Que, a fundraiser for the Jazz House Kids educational programs." ^ "The State of Jazz: Meet 40 More Jersey Greats", The Star-Ledger, September 28, 2003, backed up by the Internet Archive as of September 27, 2008. Accessed September 15, 2017. "Steve Turre -- A versatile, inventive trombonist, shell player and composer, Turre lives in Montclair with wife, the cellist Akua Dixon." Wikimedia Commons has media related to Steve Turre. This page was last edited on 1 April 2019, at 20:47 (UTC).